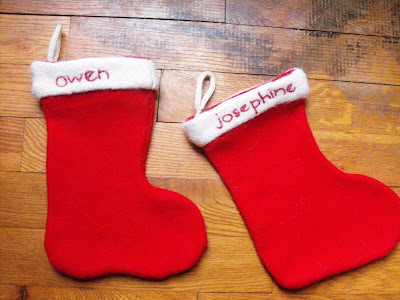 my own stocking growing up was handmade. not the sock itself, but the red felt that spelled out 'KENDRA', and i think the santa face (mom?). 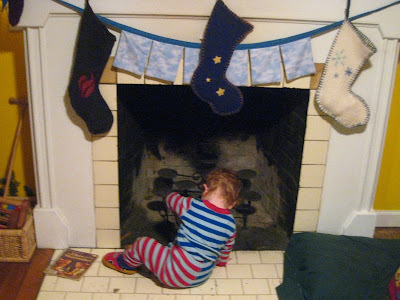 maybe it's the associated wonderful christmas memories, but i LOVE LOVE LOVE that stocking. and when my mom bought me a new one, i protested. and, yes, they are wool sweaters! blanket stitched up with yarn and appliqued/embroidered with yarn and wool pieces. papa's is green with a burning fire on it, mine white with snowflakes, and then there is our little one with the night sky and stars. this year i was asked to make stockings for our dear dear friends' children. of course i wanted them to be as special as could be, and i am still so honored to be their stocking-maker, i can't even say. i know what kinds of memories they are creating together, and to be a small part of that? well, it is truly a gift. so thank you, thank you, thank you. i loved making these, and they are full of warm and wonderful imaginings of loving family times. you know i will be thinking of you happily every christmas too. they are similar to my childhood sock, red with white trim and the name on top. only these are sweater pieces, of course. the white part is from an alpaca sweater, making it extra furry on top, and then i embroidered owen and josephine in red cotton floss. i double-stitched them too - you never know how heavy your stocking may get. see, i've been busy! more handmade goodness to share too, post-giving. lots of mistletoe and mice were presents for our family members, but some other little somethings too. i may be begging for pictures though, because down to the wire knitting jumped in the mail without a photo! have you used the u.s. postal online services? i have to give them a big thank you. these stockings were sent from portland on a thursday at 4 pm and arrived in seattle the next morning. wow! hope you're reveling in handmade love! blessings!